TV advertising is still one of the most powerful and influential tactics. Since the 1950s, the television has been the centerpiece in living rooms across the country. As soap operas, sitcoms, documentaries and more captivated people, marketers were afforded opportunities to do the same, creating one of the most effective advertising mediums ever. Today, TVs can be found in multiple rooms of the average household and new technology is emerging at a rapid pace. For marketers, the definition of TV advertising has changed as the ecosystem has expanded to include new delivery mechanisms broadening the opportunities for buys and placements. While many in the industry love to write and rewrite traditional TV’s obituary, these trends offer only one irrefutable conclusion. 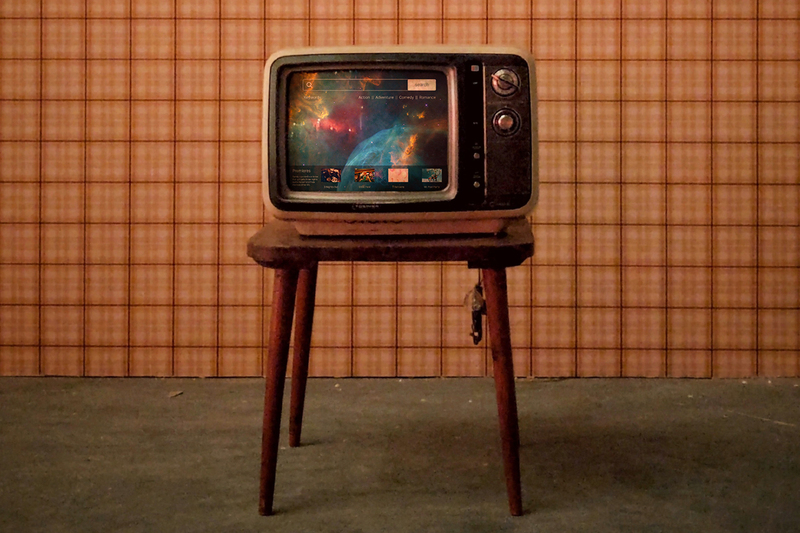 It would be wise to stop burying TV and instead embrace its evolution. Traditional TV advertising works as a megaphone, providing marketers with massive reach to increase brand awareness. Via large screen format ads, they can also target specific audiences based on a variety of program interests and demographics. 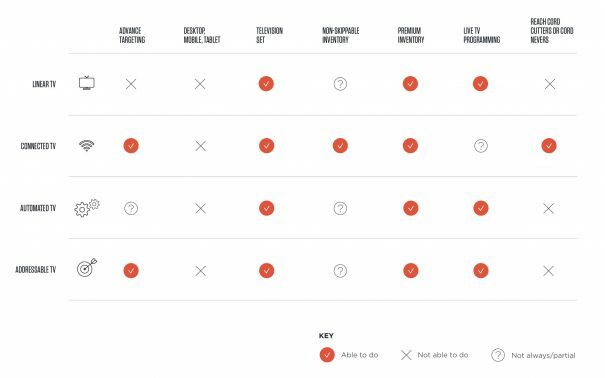 Although, these targeting options vary depending on the buy. Traditional TV: Marketers use Nielsen GRP data to secure slots that match the desired age range and gender of target audiences. Automated (Programmatic) Linear TV: Marketers use a wider set of demographic information such as household income and size that are provided by specialized data companies to identify ideal slots or programs. All viewers, regardless of demographic, are shown the ad. Addressable TV: Marketers use the same demographic information as automated (programmatic) linear TV, but instead bid on TV advertising that is delivered directly to the target household. While traditional TV advertising is arguably the most effective tactic in boosting brand awareness, there are drawbacks. It historically comes with steep costs. Viewers, especially today with their mobile devices, can be somewhat distracted. The back-to-back ad format typically results in lower ad recall. Finally, the proliferation of recording services and time-shifted viewing have afforded people a relatively new ability to skip TV advertising altogether. Netflix. Hulu. Amazon Video. Sling TV. Now TV. 10 years ago, these OTT (over-the-top) brands were relatively unknown. Today, they’re household names and disrupting traditional TV consumption. SVOD (Subscription Video on Demand): A subscription based model. Think Netflix and Amazon Prime Video. AVOD (Advertising-based Video on Demand): A typically free, ad-supported model. Think YouTube and Crackle. TVOD (Transaction Video on Demand): A transaction-based model with which users pay to access singular pieces of content. Think iTunes and Amazon Instant Video. For a television unit to be considered “connected” users must have a device such as Apple TV, Roku or Amazon Fire Stick that can access an OTT platform via the internet. While the benefits of connected TV advertising are undeniable, marketers must remain cognizant that the platforms are still new, uncharted territory. There are limitations in reporting and measurement. As crucial, many accounts are shared between family, friends and colleagues. This is important when selecting placements to ensure a brand message is reaching the intended audience. With a wide variety of streaming platforms available, audience viewing behavior has shifted dramatically in the last 5 years. 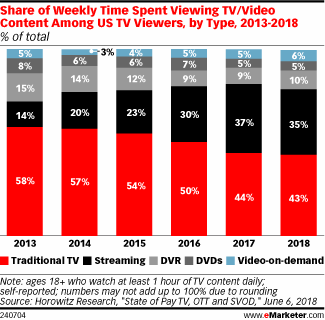 Looking for lower cost options and flexibility to view programming on multiple devices regardless of physical location, it’s not surprising that 60.7%4 of the US population viewed videos via an OTT platform in 2018. This percentage is expected to increase to more than 64% of the US population by 2022, an additional 17.9 million people. It’s crucial that marketers consider the unique capabilities of each TV advertising channel to target the appropriate audiences with the most effective messages. While certain types of buys get brands in front of the right audience, the effectiveness of TV advertising also depends heavily on the creative execution. The most successful TV advertising makes a visceral connection with viewers. It doesn’t matter if it’s a 60-second Super Bowl commercial or a hyper-targeted, six-second pre-roll video, a well-told story establishes positive associations with brands and their products and services in any format. Ultimately, viewers’ emotional responses have a profound impact on their purchase decisions. The frequency of that TV advertising serves to strengthen those associations. When Nike shows its customers a series of spots with athletes performing at a high level, the brand eventually becomes associated with sports excellence. When Pepsi shows its customers extensive video marketing of people having a great time with a refreshing glass of soda in their hands, the brand becomes associated with memorable moments. It would be wise to stop burying TV. Well-crafted TV advertising remains one of the most powerful and influential mediums for marketers to drive brand awareness and increase reach. As it continues to evolve with emerging technology, marketers must consider both traditional and connected TV to maximize opportunity.